All 16 boxes come in the single colour of your choice, in a random selection of mixed colours (choose "random"), or in a random selection of mixed transparent colours (choose "transparent random"). The tray is clear and contains the 16 boxes and comes complete with screw holes for mounting on the wall. 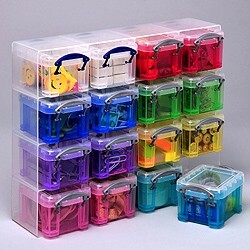 An extremely useful compact storage set. Easy to view contents at a glance. My granddaughter loved the product as she is adept at making slime a new craze which most youngsters are doing and the storage unit is perfect for storing the slime creations . Each container is removable so can n be transported if needed i.e. to a friend's house. Brilliant for my daughter who is a jewellery maker. 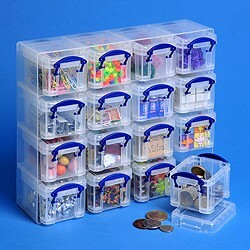 Fab for seeing the different beads and perfect for keeping beads together BUT tidy. ha ha. These boxes are great because the individual boxes have clip lids to use separately or to be stored in their case. Amazing colourful boxes, packaged well and arrived quickly. Highly recommended. Very useful little storage boxes for my daughter's desk.